Every good parent needs a bag of tricks or in this case, a cupboard. At times, the reality of life at home with young children can be a bit less like a family dinner on “Leave it to Beaver” and a whole lot more like the introductory scene to the pilot of “Breaking Bad” (think Bryan Cranston frantically running around the desert in only a pair of underwear, a gas mask and a green apron)- complete and utter chaos. How does one get around to cooking dinner, answering an important phone call or simply a restroom break while in the care of young children? Here is a tour of my Chaos Cupboard. We’d love to hear about what you stash in yours! 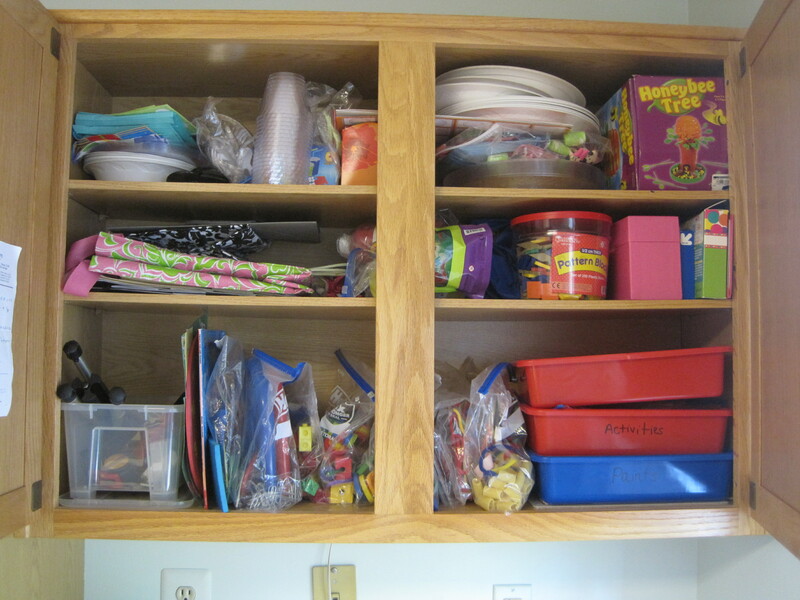 The bottom shelf of my Chaos Cupboard is stocked with activities, each in its own gallon baggie along with a set of display bins on the right. View the bottom shelf in the picture above. You will see a row of gallon bags, each with its own activity (I recommend “slider” baggies as children can open and close these with ease). To the right of the baggies, there is a bin for displaying the activities and two other bins with smaller activity options that did not require a large bag. 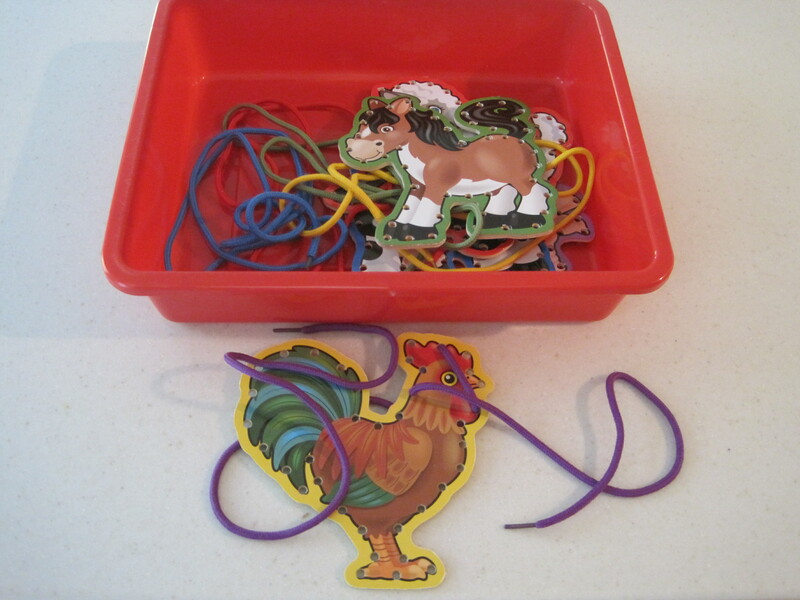 When madness ensues, I pull a bag from the left side of the shelf and dump it into the red bin and place it at the table for my children to explore. When the children loose interest in the activity, I dump it back into its gallon bag and place it on the right side of the row of bags to ensure a proper rotation. You may ask, what type of activities are appropriate to offer in the Chaos Cupboard? 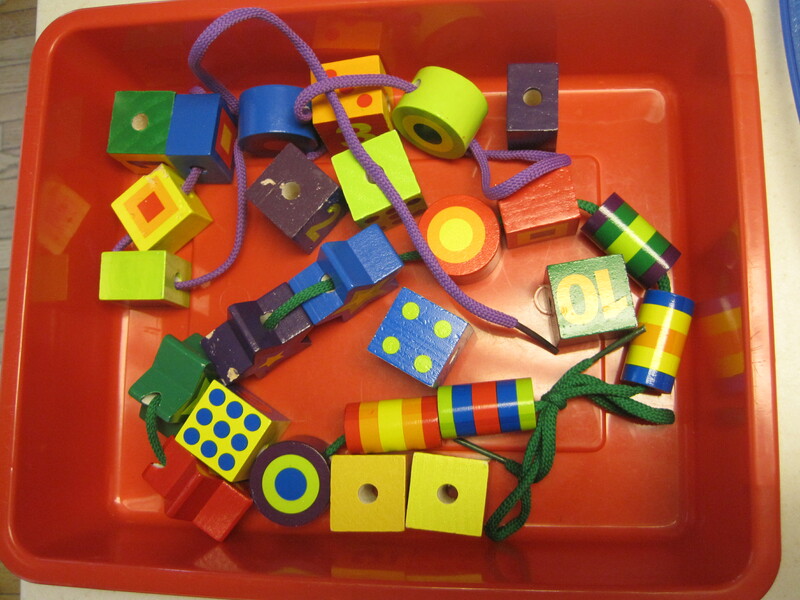 Select activities that have many parts and pieces that would typically get lost in a toy chest. 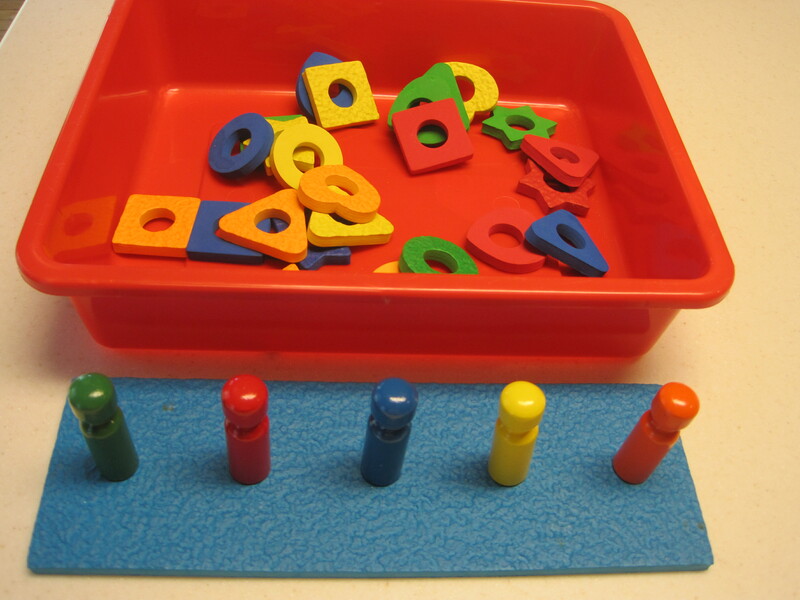 These types of activities are best used in sets as all the parts relate best to each other. They also usually will only captivate a child’s attention for around 5 to 20 minutes and so they are best used in a rotation system. Below you will see examples of activities that I include in my Chaos Cupboard. 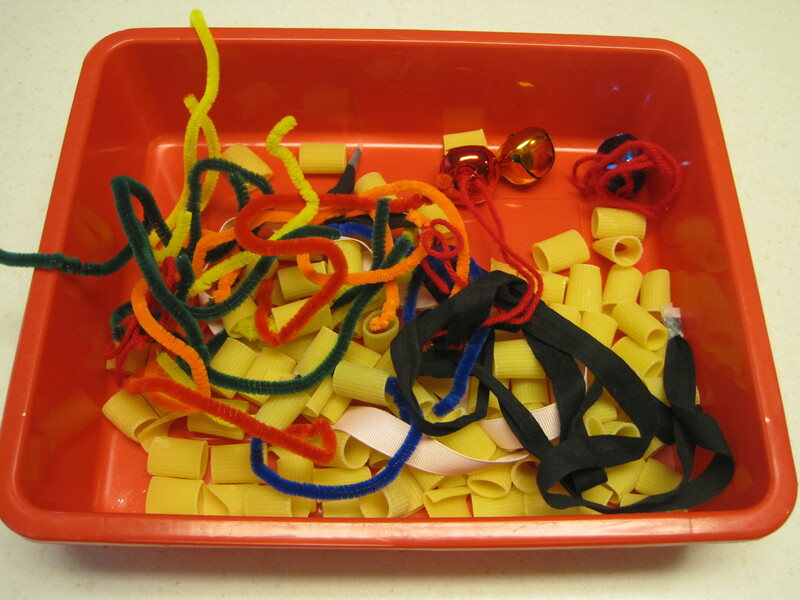 Pipe cleaners, uncooked noodles, jingle bells and assorted ribbons. 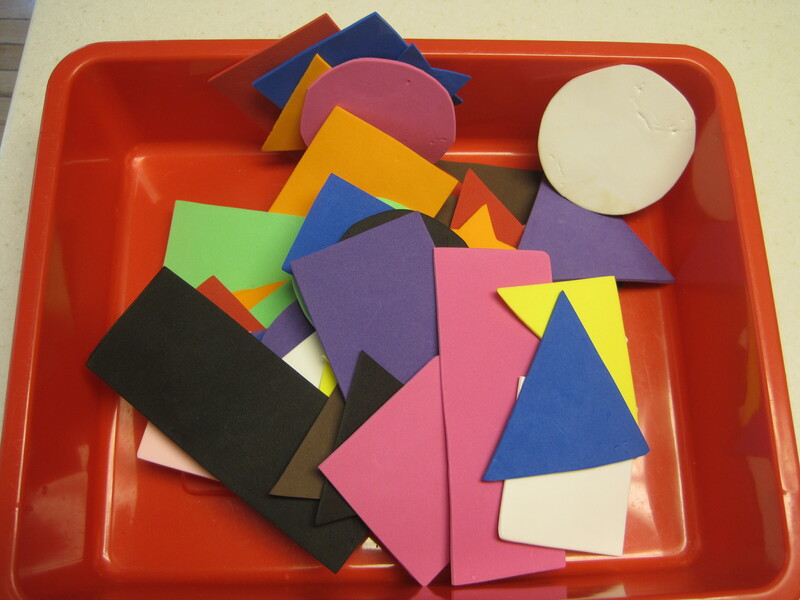 Smaller activities stored together in a bin: grab bag, grease-board crayons and eraser, foam shapes, wax sticks, sea shells). 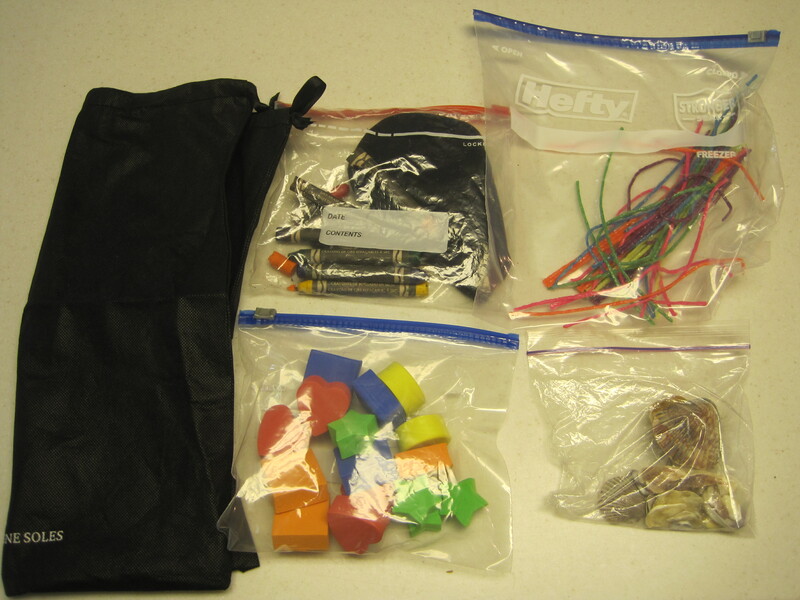 To play with the grab bag, hid various items inside and encourage your children to guess what they are by feeling, not looking. Sing, “Grab bag, grab bag, what do you have? Look inside and feel!”. Five minutes of peace and tranquility can be yours! Chaos cupboards do not need to use up much valued cupboard real estate, nor do they need to bankrupt your spending cash. 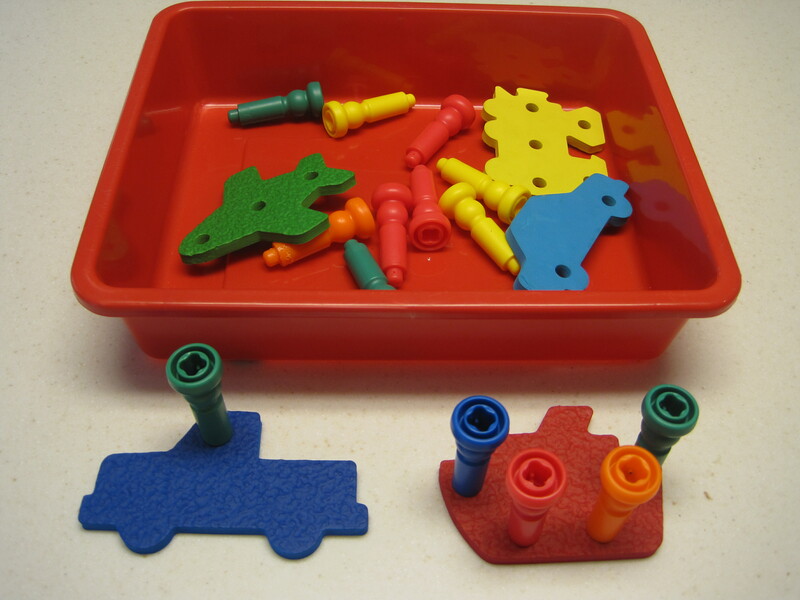 Sort through the toys, puzzles, games and odds and ins that you already own to create a set of ready-to-go activities, then add to your collection as you go. 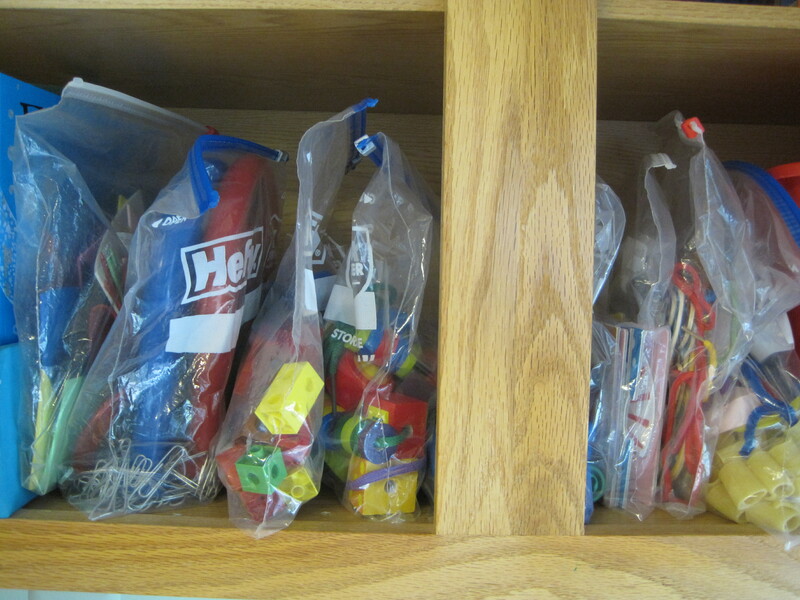 Using gallon baggies to store the pieces, instead of boxes and individual bins saves on space. 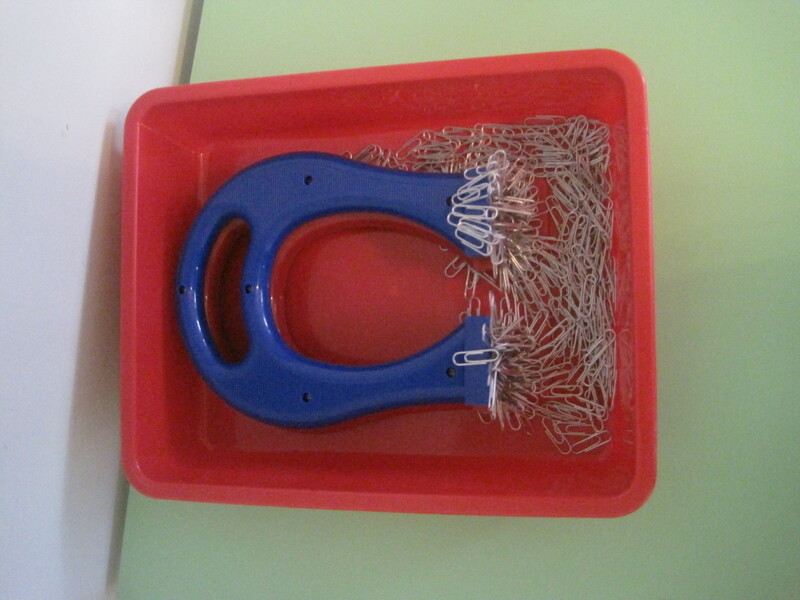 Just remember to keep one bin nearby for display. Best of luck! Hi! Great ideas. May I ask where you found the color blending puzzle set? 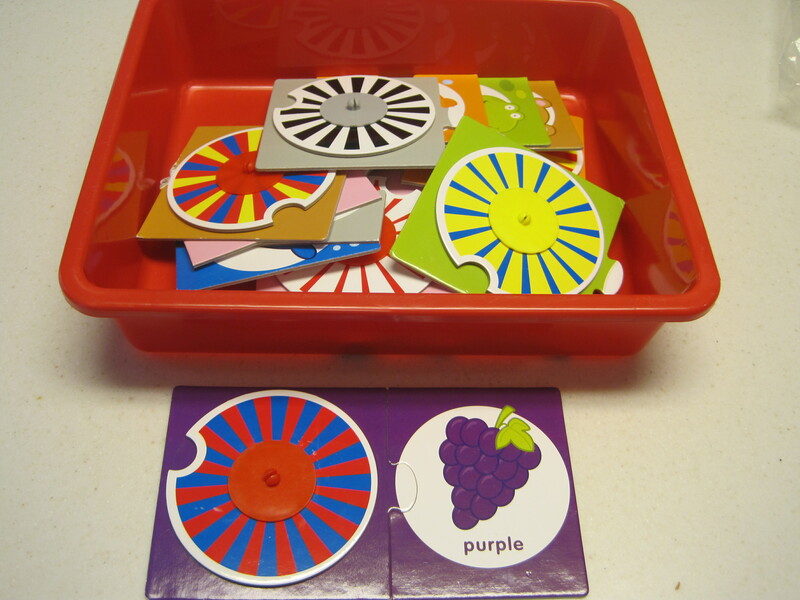 I haven’t seen anything like that before, and am always looking for great toys that teach color theory. Thanks for reading! 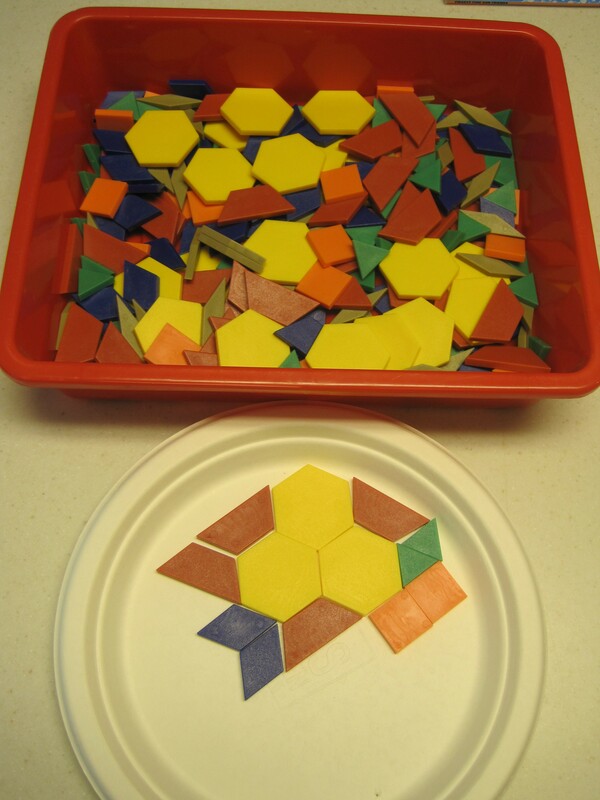 The puzzle is made by Infantino, but it is around 4 years old and so I am not sure if it is still in production. Hope you can locate one! I’ll let you know if I come across another product that is widely available. What a genius idea I never would of thought of it. I am going to have to try it. I have some activities for her but I don’t have a designated spot. This is a terrific idea.